Dropship service means Tsingtaohair shares stock wigs with you and saving delivery cost and time. Step 2: After receiving the payment, you submit the order to Tsingtaohair. Tsingtaohair allows drop-shiping orders for all registered customers. 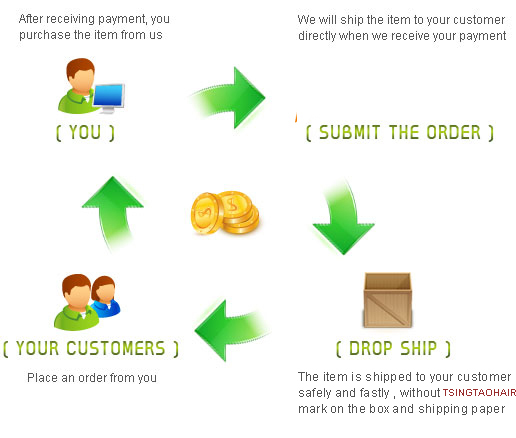 We do not charge extra cost for drop shipping service. Just order online in the same way as usual, and put a new shipping address when you checkout theorder . or phone you to verify before processing the order. We do not include Tsingtaohair publicity materials / invoices etc when we send drop ship goods, so it protects your reputation as a seller. out that these are values for customs declaration only. In any case a lower price declared helps reduce ad-valorem duty or sales taxes that your customer may have to pay when receiving imported goods in certain countries. QUESTION: I'm interest in dropship service, I been a hairstylist for over 10 year. This program sound like it perfect for me. Is it free? Please can you tell how to go about this. ANSWER: Thank you for the interests in our drop ship service. Our company offers drop service freely to help our professional customers grow business. You need to tell us your business name and the drop ship address. If you pay via paypal, you need to tell us the drop ship address in the memo of paypal. Our company will ship your orders directly to your customers with your business name as sender and your customers won’t know our factory. ANSWER: TSINGTAOHAIR offers good prices and service for our wholesale customers. To enjoy our wholesale program, you need to verify you have wig store, wig online shop or you do wig business or you buy wigs for wholesale. Then our company will offer you the wholesale service once you order from our company. If you are an individual customer who buys wigs for yourself, friends or family, you can also join our wholesale program; you only need to order products with value $2000 to have our wholesale services. QUESTION: However, I would like to have some clarification on your $2000 product orders, to get started with, do items have to be purchased, in that amount, or items up to that amount, have to be purchase to get started with your wholesale services? ANSWER: The amount can be accumulated. Once you reach $2000, you will become our wholesale customer and enjoy wholesale price. QUESTION: Also, you stated that you can provide OEM service to your wholesale customers and that you produce products with their company’s mark or logo. Hence, do you place logo labeling into the wigs and is this an extra charge for the service ? ANSWER: For OEM service, we offer it freely but it needs the customers reaching a bulk quantity at least 200 wigs every month consistently to start it. If can’t reach this quantity, there is an extra charge for it as there is minimum order quantity to produce mark, label or package. We can place your own logo labeling into the wigs. Whether it is free or need extra charge depend on how many wigs you can order.